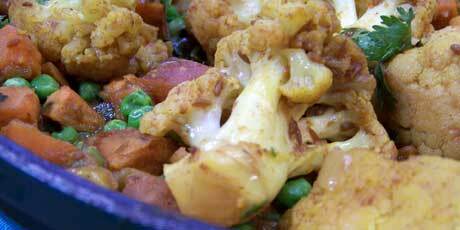 A delicious Indian dish that's also vegetarian from Michael Smith made with cauliflower and sweet potatoes. 1. Melt the butter in a large skillet over medium heat then add the cumin seeds. Gently fry them for a minute or two, heating them through, removing any shelf staleness and brightening their flavour. 2. Add the onions, sautéing them until they soften. Add the cinnamon and curry powder and stir well for another minute or so. The direct heat of the sauté dramatically brightens the flavours of the spices. Add the sweet potatoes and cauliflower and stir well until they're coated with the spices. Season with salt, add a splash or two of water, cover with a tight-fitting lid and lower the heat. Continue cooking until the sweet potatoes are tender, another twenty minutes or so. Just before serving stir in the peas and cilantro, heating them through briefly.